Donna has been with our office since 1991. She graduated from UC Blue Ash Dental Hygiene program in 1985. 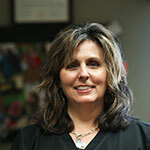 Donna takes a personal interest in our patients, genuinely cares for them and their oral health. She is married with two adult children. Donna enjoys biking, hiking and volunteering with the youth ministry team and other events at her church. She loves spending time with her family and friends along with a nice glass of Ice Tea!